Christmas in Helen. A visit to this charming Bavarian village is sure to put you in the holiday spirit! The merriment begins the day after Thanksgiving and goes through the end of the year. Open House and Mistletoe Market. Shop for locally made, handcrafted art and fine crafts. Christkindlmarkt. A traditional German market featuring imported and local holiday specialties, music and entertainment. Dropping of the Edelweiss. A New Year’s Eve party with hors d’oeuvres, dancing, and a midnight champagne toast. Victorian Christmas. Step back in time and see what Christmas was like in the 1870’s at Hardman Farm Historic Site. The open house—on several weekends in December—includes traditions and decorations from that era, live holiday music, hot chocolate and a twinkling lighted path taking you to and from the parking area. Christmas in the Mountains. Downtown Cleveland, Georgia, gets festive with a lighted Christmas parade and a Holiday Marketplace on the Courthouse Square with Merry Merchants open houses, food, and fun. Head to Freedom Park for more special activities, including a luminaria lighting, Christmas tree lighting and musical performances. Christmas at the Gorge. Drive 30 minutes east of the Inn to Tallulah Gorge and you can enjoy a merry time at one of Georgia’s natural wonders. Festivities include craft making, Christmas music, holiday snacks and a visit with Santa. Vogel State Park Tree Lighting. This lovely event outside Blairsville pairs gift giving with celebration. Bring an unwrapped gift for a child 12 years and share in the holiday spirit with activities that include hayrides, holiday music, hot beverages and cookies, a Christmas program, and lighting of the tree. Visitors are encouraged to bring chairs and blankets. Christmas in the Cabin. Gather with other merry-makers and cozy up by the fire in the cabin at Smithgall Woods State Park to enjoy hot chocolate or hot cider. While there, you can make an ornament for your tree or to give to that special someone. Holidays at Lucille’s. A cozy room, complimentary fruit and cheese, evening dessert and three soothing spa treatments await you when you book our Relax, Recharge Spa Getaway Package—perfect for de-stressing during the busy season. * Call today to arrange your stay, or book online! *Package does not include room cost. 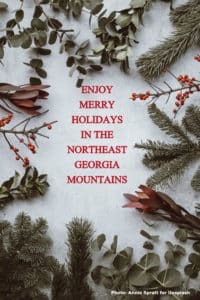 This entry was posted in Georgia Bed and Breakfast, Georgia Mountain Activity, Georgia Mountain town, Holiday Events, Packages and tagged Christmas Shopping, Georgia Bed and Breakfast, Georgia Mountain Activities, Holidays, North Georgia Mountains by admin. Bookmark the permalink.